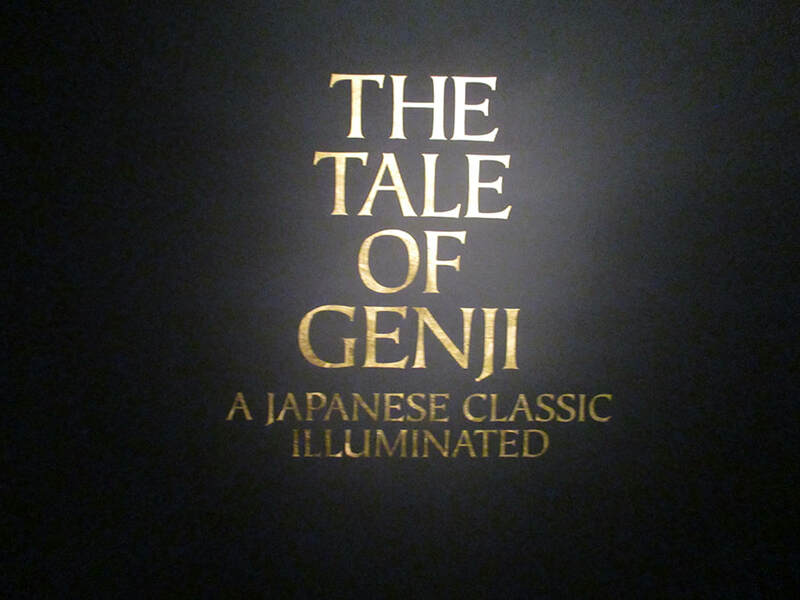 "The Tale of Genji: A Japanese Classic Illuminated"
“The Tale of Genji: A Japanese Classic Illuminated” at the Metropolitan Museum of Art looks at the treatment of a classic Japanese literary work in the visual arts. The exhibition brings together more than 120 works of art from 32 public and private collections in Japan and the United States including paintings, calligraphy, silk robes, lacquerware, a palanquin for a shogun’s bride, and popular art such as ukiyo-e prints and contemporary manga. “The Tale of Genji” was written approximately 1,000 years ago and has captured the Japanese imagination ever since. It is a romance but it is also social and political commentary, aesthetic theory, Buddhist philosophy and a behavorial guide. The story centers upon Genji, who is the son of an emperor and his favorite concubine. However, the jealousy of other members of the court leads to his mother's death and to Genji being demoted to the status of commoner. To regain his status, Genji proceeds through a series of liasons with ladies of the court. One such romance is with the emperor's new concubine. (Their son eventually becomes emperor). After a period of exile, Genji returns to the capital and his position and influence at court steadily increases. Perhaps surprisingly considering the traditional role of women in Japan, the author of this tale was a woman. Murasaki Shikibu was a noblewoman, the daughter of Fujiwara Tametoki, who was known as a scholar and man of literacy. Her mother died shortly after she was born as did her elder sister a few years later. She married and had a daughter but her husband also died. It was against this tragic background that Murasaki wrote “Tale of Genji,” exploring the relationships between men and women. 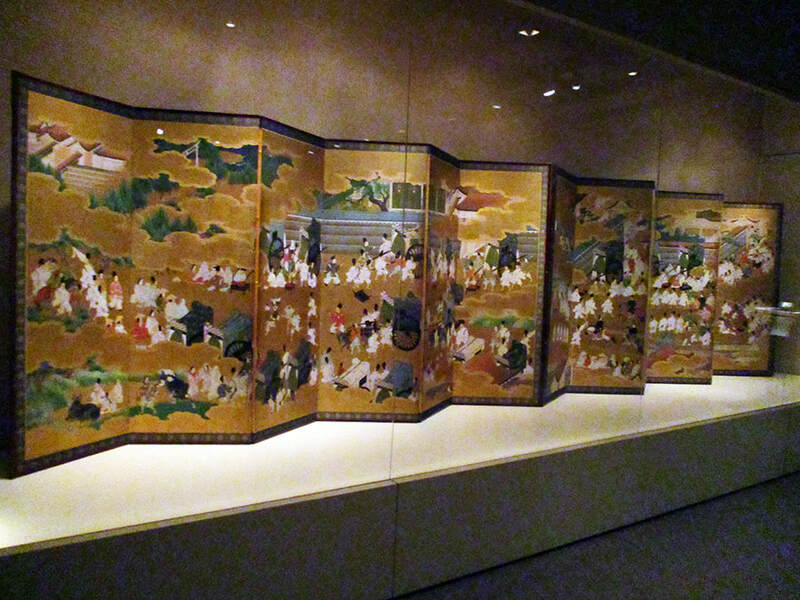 As the exhibition demonstrates, “Tale of Genji” brought Murasaki enduring fame. A frequent subject of paintings down through the centuries has been Murasaki writing her masterpiece. Naturally, the story itself has also been the subject of works of art. Since the story has 54 chapters and is rather complicated, artists have selected parts of the story to illustrate. Over the years, motifs and conventions developed as a shorthand for various aspects of the tale. While Genji art has traditionally involved bright colors and glittering gold, the exhibition shows that some artists have used monochrome painting including ink-line drawings made by amateur artists. These were often made by and for women and illustrate how the tale was perceived by women. Also, more developed ink-line drawings were made by professional artists beginning in the Edo period. 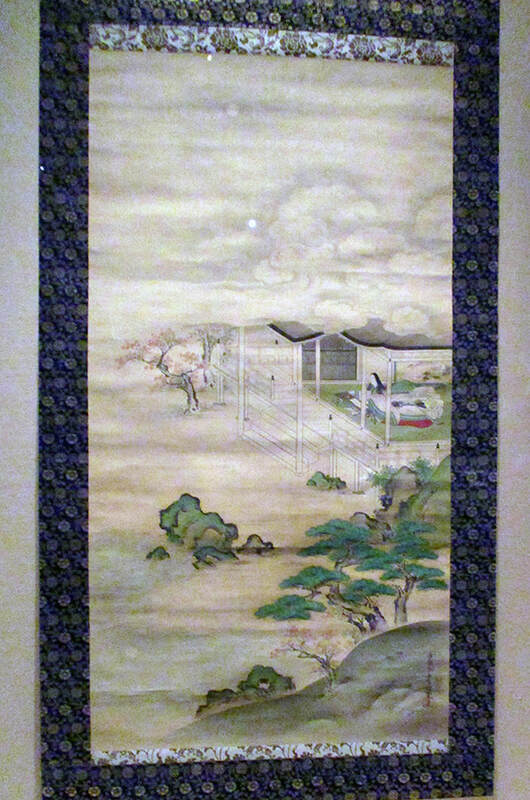 Combined with Chinese painting techniques, this led to a new approach to Genji art. Also, anything that achieves such a level of fame invites parody and the exhibition contains examples of parodies of Genji. Artists took the familiar characters and placed them in contemporary settings for humor and in order to comment on the issues of the day. The exhibition thus introduces viewers to a rare phenomenon. Outside of religious scripture, it is difficult to think of many literary works that have served as inspiration for visual artists for such a long time and to such an extent.